This is the third time we are seeing the standard version of this brawl. Odd Paladin is strongest right now, it's pretty cheap also. Look it up! I just want to make a quick 0-3 run. Does anyone know what are the rewards for a 0-3 run compared to a 3-3? am i weird for enjoying this way more than other constructed tavern brawls that break and degenerate super easily? because let's face it even in things like double deathrattle people will jsut be playing egg hunter or the meta deck that gets pushed to tier 0 with the brawl rule, this one is jsut play and get Arena like rewards, it isn't hard to go into the 5 wins territory which means you go even, and you get to farm some packs and cool stuff. I've always really liked the Brawliseum because as much as it is standard, it also tends to have a more self-contained meta which I find really cool. A lot of tavern brawls tend to devolve into some crapfest of degeneracy, with only a few brawls feeling like it prevents this sort of thing to happen. Still a great time to brawl since the event is free for your first shot. After that, I guess the timing is a little off since all the F2P spent their gold already, so this caters to the paying players. Wait a month next time, Blizz. Fairly certain it happened last time too. If not same week, the week after. 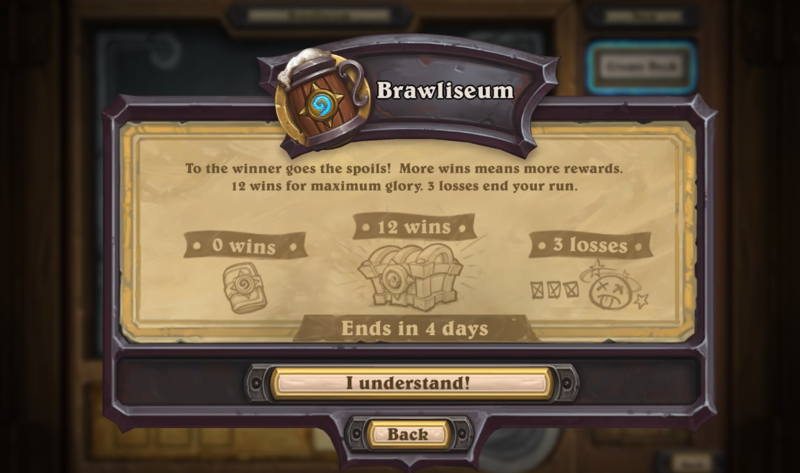 I remember them doing a brawliseum before an expansion and everyone cried it was a money pull by blizzard to get F2P to spend 1000 gold on an entry and then not be able to buy as many packs. (Although confident that was a few expansions ago). Because the meta hasn't settled yet, so now you'll see a lot more diversity in this brawl. The other brawls i were pretty much 2-3 decks that you kept seeing over and over. Just went 12-1 with quest fatigue priest. Mojomaster Zihi won me so many combo matchups. EDIT: Not sure the vote down because I am simply asking to see the cool 12 wins. Can you link the deck? Priest doing well surprises me!